New features are coming to the platform in May for managing and automating the creation of emails even more effectively and intuitively. Let’s imagine the ideal world of today’s marketers. They have little time, tons to do, demanding standards, and zero tolerance for errors. When they publish a new blog post, the text materializes into a perfectly optimized email message, without them having to re-type anything. When they launch a new collection on their e-commerce site, the products automatically populate a mobile-responsive DEM, recalling prices, images, and links to the product pages. When they segment emails, they do so in the platform by directly filtering the special offers for their Milan shop, London shop, and New York shop. Science fiction? Not anymore. We are pleased and proud to present three revolutionary features in the MailUp platform: starting today you’ll find content residing on external platforms directly in the editor, already optimized to be dragged within the message with a simple gesture. No more copying and pasting text and links, no more manual image uploading, no more obsessive checks to guarantee content’s correctness. Put your energy where you need it most: creating perfect content for your blog or website. It will be identical in your emails. Do you remember when we introduced content sources in April? Let us remind you: the system that makes creating automation easy and intuitive based on RSS and Atom feeds, (automatically) sending emails that (automatically) retrieve content published on your site or blog. In short, starting today on MailUp you can upload most digital formats as sources. Certainly the most common and widespread ones. The next step? 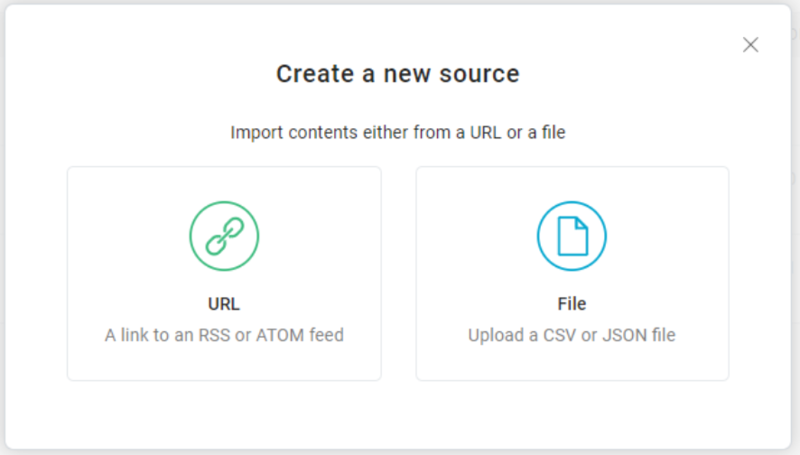 Offer you the ability to create content sources by uploading APIs, Chrome extensions, and Zapiers. Now that you can create a large number of sources, we assumed it would be useful to accompany them with a tool that can put it all in order and make sense of it. We’re certain that lots of brands will begin to create, test, and accumulate different sources, with the consequent risk of their losing any sense of order, making it hard to sort through hundreds of different types of content. An interesting dilemma. But have no fear. We have also developed a search and filter system to eliminate the issue: you can view exactly what is inside a source thanks to a convenient preview of its content. “Content is king“, as we’ve often heard in recent years. Custom rows, the second big novelty of the platform, reflect this philosophy to a T.
But let’s see what they consist of. Considering how now a source can make content available on the platform, we thought it would be useful to make that same content accessible in the BEE editor. 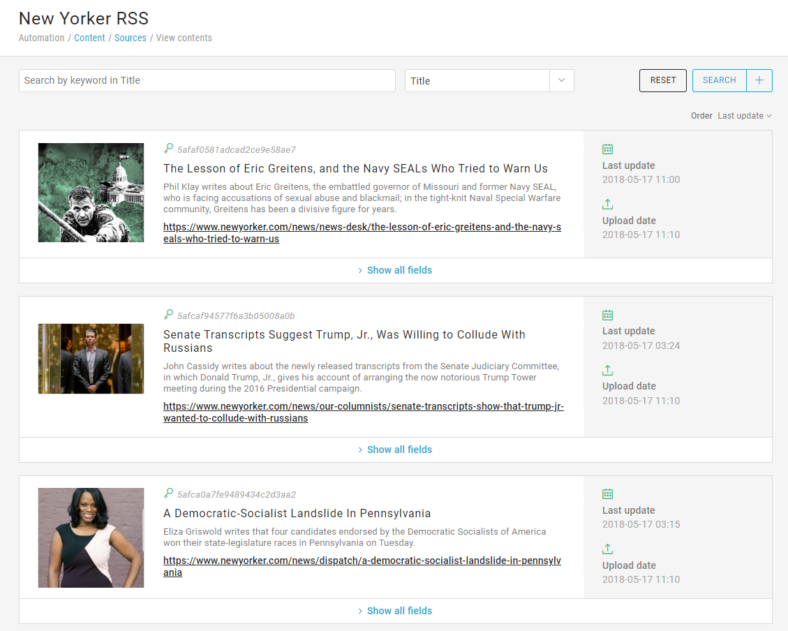 The content is loaded via the source (as we saw before, via a link or file) and immediately made available in the BEE editor in the form of content blocks. Just go to the Structure tab in BEE and select the source you want to retrieve content from in the drop-down list. The various content will appear in the right-side menu, already formatted and with a predefined layout. All you have to do to insert a custom row is drag and drop it inside the body of the email. Once inserted, the content’s text and images can be modified. The same email can have a custom row inserted from one source (i.e. your blog’s RSS feed) and a custom row from another source (for example the special offers of the month uploaded with a CSV file). In short, you now have maximum flexibility for including – in an immediate way and with simple drag & drop operations – different content belonging to different sources. This feature lets you say goodbye to all those errors caused by incorrect copying and pasting. Just think of e-commerce, and all those files you used to have to upload to the platform that show the name of the item for sale with its relative price. Custom rows give you maximum control over this situation, as well as many others. It’s happened to all of us: we lose something we’ve been working on due to our mistake or a system anomaly. We’re talking about both written text and graphics. Hours of work that, despite intense attempts to recover them, are irretrievably lost. That’s why, staying on the subject of content, we have introduced email autosaving in the BEE editor. Did you accidentally close the platform? Did a blackout cut off electricity to your entire city, paralyzing you in front of the computer not for fear of the dark, but for fear of having lost hours of work on your newsletter? Starting today, BEE will immediately offer the message’s last saved version when you log in again. An alert will give you the option to resume editing the message, preview it, or ignore it. The MailUp platform is constantly evolving thanks to constant research into features and resources. If you haven’t tried it yet, we strongly suggest doing so! By requesting a trial, you will have free use of the platform for 30 days. Milan-born from a Seychellois mother and a Sicilian father. I hate the sea. A linguist by education, I work as a Product Marketing Specialist at MailUp. Just like Socrates, I know that I know nothing.